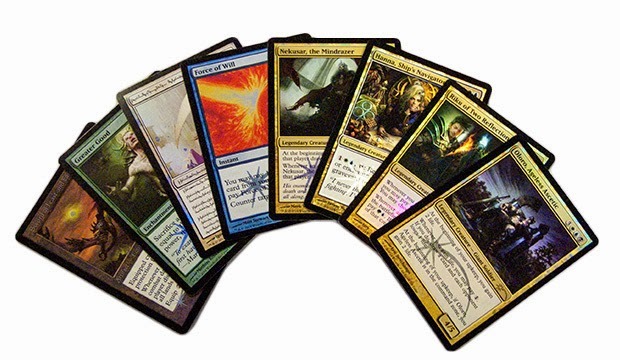 We here at MTG Realm are looking forward to the upcoming Friday Night Magic event at OMG! Games tomorrow night - why you ask ? Well funny you should ask - one of the local players (good guy Johnny Bremner) found a rather critical card we were looking for and we think it will make all the difference in the world how smoothly our standard format deck will now play - we'll give ya an update early next week. Anywhoos, with our recent orders from MTG Mint Card and Johnny's contribution, we feel confident in hitting the Top 8 with relative ease. As we're spending the evening getting a feeling how our new monster is working, we wont' be writing a high-brow article on Magic: the Gathering but rather defer to our sister site, MTG Realm on Tumblr to deliver the fun - let's go ! 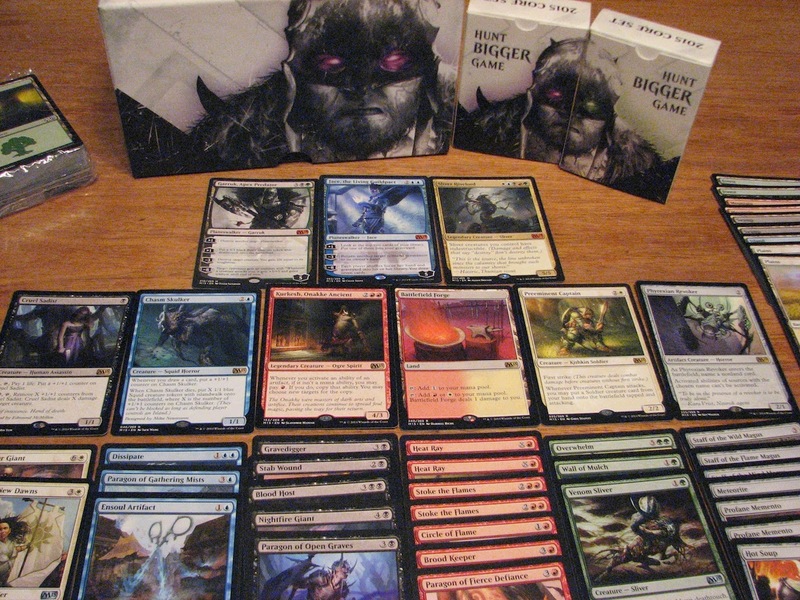 Ultra PRO Collectibles - Magic: The Gathering Speed vs. Cunning Duel Deck boxes! Racing across the blazing steppe, the wave of attackers crests the barren hills. Nothing can stop their reckless advance. These warriors live fast, fight hard, and strike terror into the hearts of those in their path. The scarred countryside seems abandoned. Then, suddenly, hidden fighters spring from ambush. The overconfident enemy recoils in surprise, outflanked and outsmarted. Who will prevail, the swift or the sly? This superb bed quilt declares exactly where the Magic happens in the household. Posted to Imgur by WenMon. 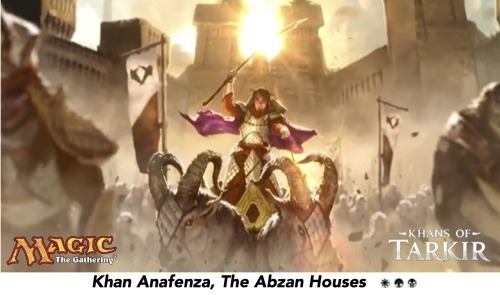 A rather short 45-second video showing the Khans from the next MTG set, Khans of Tarkir which included the Planeswalker Sarkhan. 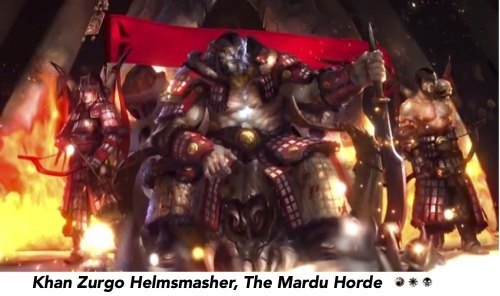 The names I’ve attached to the images are NOT official. Video posted to the mothership over here and my other notes from the MTG Panel over here. * WBG (centered in white). • Symbol: Scale of the Dragon. * URW (centered in blue). •Symbol: Eye of the Dragon. * BGU (centered in black). • Symbol: Fang of the Dragon. * RWB (centered in red). • Symbol: Wings of the Dragon. * GUR (centered in green). • Symbol: Claw of the Dragon. Some rather interesting news for those of you readers who venture beyond your local Friday Night Magic events and go on to play in the big league. We've done a very brief summary here for you but suggest you hit up the mothersite to get the full monty over here. First up however, let's talk about hard to get judge foils which may actually may become a titch more difficult to obtain (on the secondary market). The Magic Judge Exemplar Program is a brand new Judge Reward Program just recently announced this week. Magic Judges certified by the DCI are often the un-sung heroes of large tournaments where they provide consistent rules enforcement and promote fair play among a myriad of other tasks. 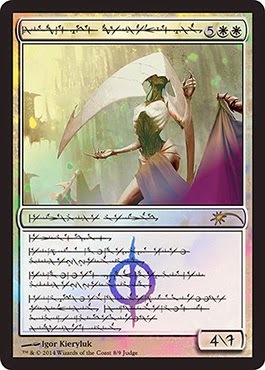 Judges are typically unpaid for their very hard work but are rewarded through a Judge figt card program where foil Magic: the Gathering cards were either handed out or mailed out to judge staff who worked at MTG tournamdents and events. Started in 1998, the Judge reward program evolved over the course of the years and in recent years provided approximately eight to ten possible promo cards to be 'earned'. A number of these promo cards are actually worth a bit of money and has in the past helped some Judges offset the cost of their participation (travel and accommodation) in said event / tournament. These cards would often find their way on to eBay or retailer's websites where collectors would snap them up. That has all changed now - for the better or worse, it is up to you to decide. Announcements on 'The Magic Judge' blog introduced the Exemplar Program as the new method of distributing foils to judges in the DCI judge program. 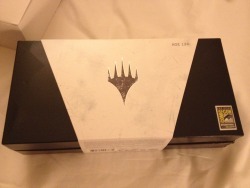 The most immediate effect of the foil “policy” change is that judges at GP events will no longer receive foils from WotC as gifts for their efforts. The Exemplar Program will begin in 2014 for L3+judges and will be fully implemented for all judges in 2015. While judge activities will continue as before, in 2015, judges foils will only be available as part of the Exemplar Program which will use a recognition-based process that will award judge foils to a wider audience of judges based on their contributions to the judging community. This may mean fewer Judge foils making it on to the secondary market and may impact large tournament organisers latter in the 2015 schedule as they may be required to offer additional incentives or compensation for certified judges - it really is too early to tell. Yesterday on the mothersite was a series of important updates from Helene Bergeot, Director of Global Organized Play Wizards of the Coast. 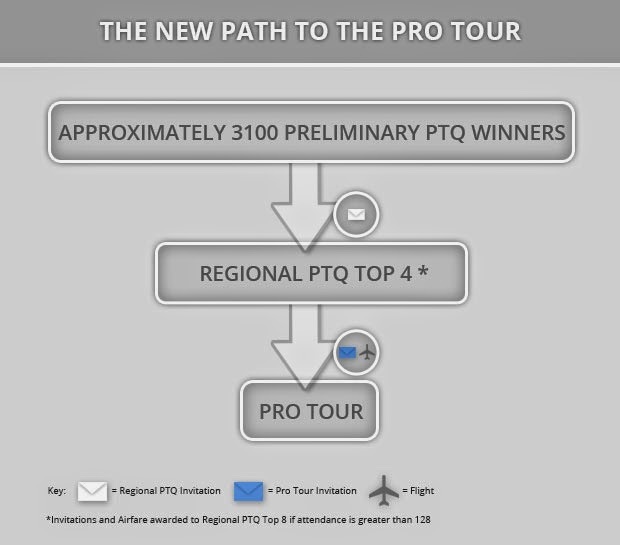 We suggest that if you are a regular at the large tournaments, you read all four articles to get a handle on the number of changes to the Pro Tour Qualifying (PYQ) System which is to take effect starting with the qualifiers in December. We here at MTG Realm are still processing all the revelations from last weekend's Magic: the Gathering Panel at San Diego Comic-Con. 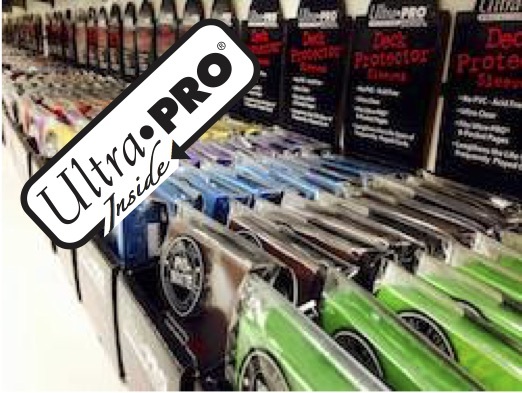 For today's post, we want to cover off the previews for this November's upcoming Commander product release. For the first time ever, you can lead your forces with a Planeswalker commander in this exciting multiplayer Magic format. Dominate the battlefield with new combinations of strength and skill. Swarm opponents with mighty creatures and arm yourself with powerful artifacts. But fight wisely, for only one commander will prevail. 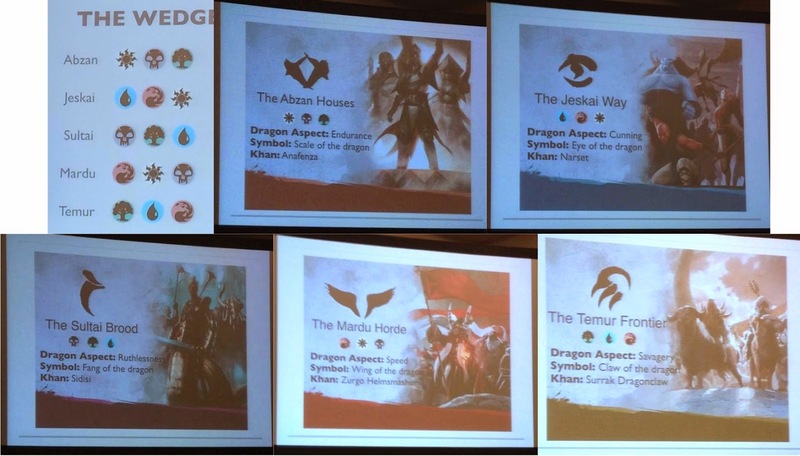 Also for the first time ever, Planeswalker commanders will headline five monocolored 100-card Commander decks. 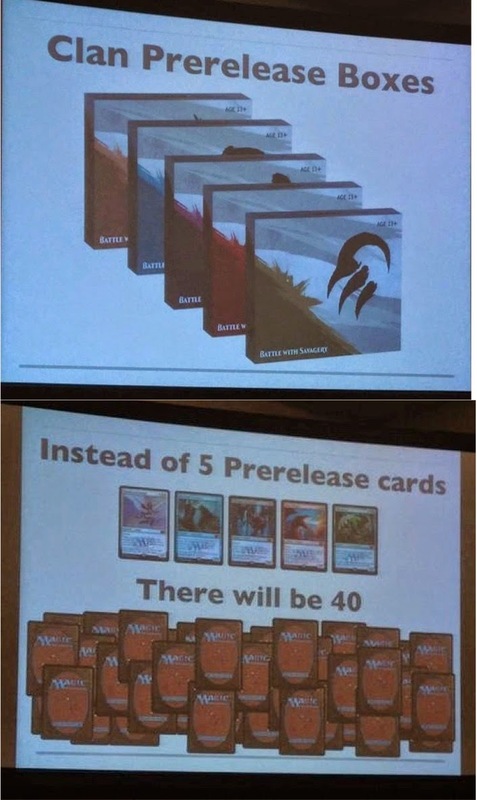 There will be 61 new cards legal in eternal formats (Vintage and Legacy) but not legal in Standard, Block Constructed, or Modern, with 15 new cards in each deck. 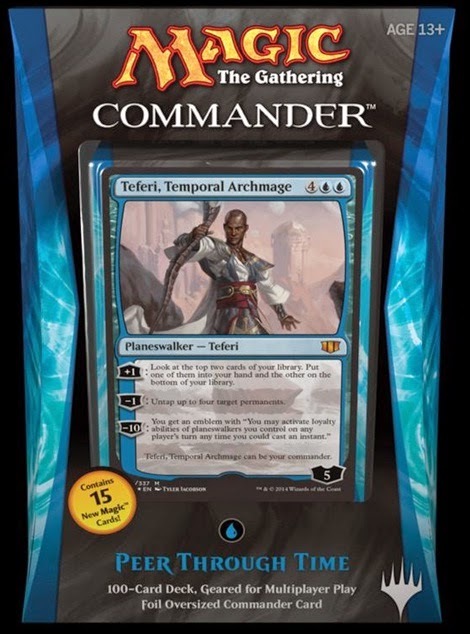 • Teferi, Temporal Archmage - (to be featured in the blue 'Peer through Time' decklist), from Dominara. • Ghoulcaller Gisa - from the plane of Innistrad, the sister of Geralf, both necromancers. +1: Look at the top two cards of your library. Put one of them into your hand and the other on the bottom of your library. -1: Untap up to four target permanents. -10: You get an emblem with "You may activate loyalty abilities of planeswalkers you control on any player's turn any time you could cast an instant." 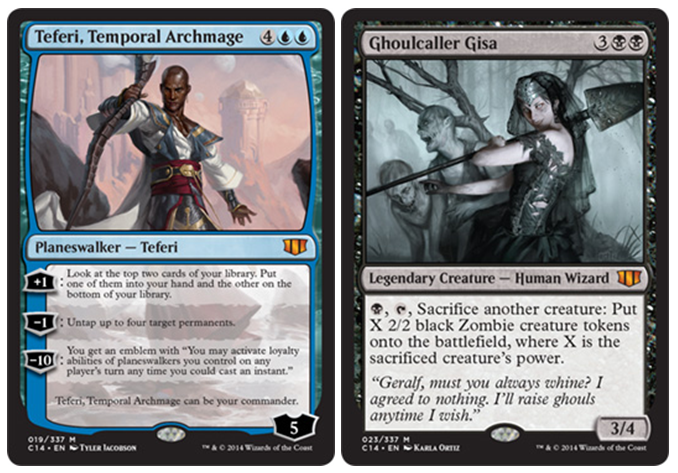 Teferi looks to be crazy good and incredibly powerful. The first two abilities are solid while the third is so conditional that we would not really want to plan on using it, like evar. Gisa is set to puke out hordes of zombie tokens for an alpha strike or some sacrifice shenanigans. 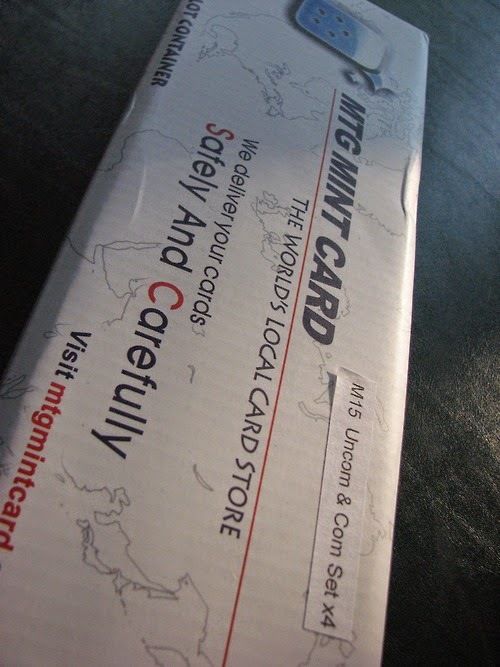 We will likely pick up at least two of the five decks and will be ordering singles from the other ones from MTG Mint Card. 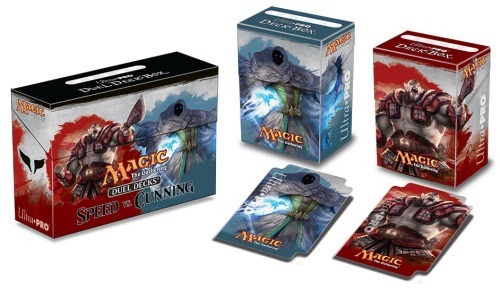 Stay tuned to latter posts on MTG Realm as we play catch-up on all the very exciting announcements including our postulations / speculations on the next Duel Deck - Speed vs. Cunning, due to be released on 5th September, 2014. Until then, happy gaming everyone! 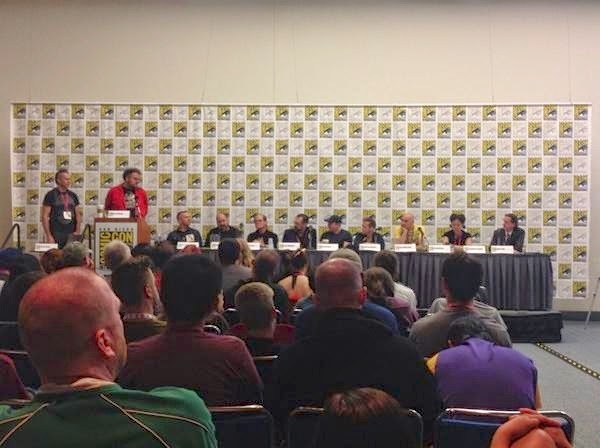 Very giddy and excited here over all the amazing / awesome / intriguing revelations from the Magic: the Gathering panel today (just wrapped up a few minutes ago) at San Diego Comic Con. There will be a host of further posts here at MTG Realm to go over all the spoilers 'n' previews from upcoming Wizards of the Coast MTG product but for now, we're doing a quick and dirty summary of some of the high lights. Many thanks to WotC staffer Alison who had provided blisteringly fast posts to the MTG Twitter machine. It is from here we've obtained most of the images and text news. Let's go !! From the Vault: Annihilation is Coming August 22! 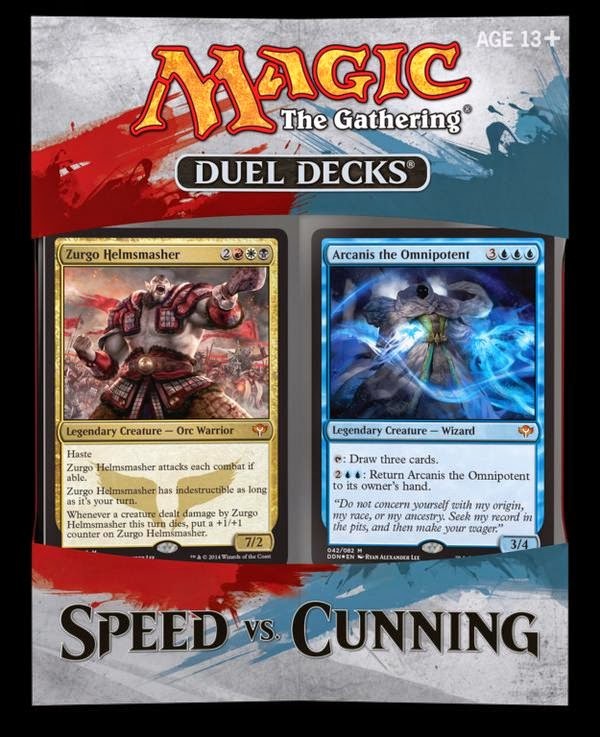 Coming September 5th, Speed vs Cunning Duel Deck! Commander set out November 7th! 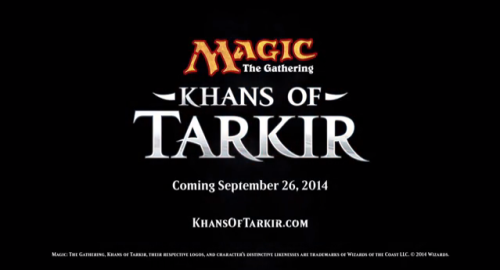 KHANS OF TARKIR TEASER TRAILER IS PLAYING NOW! 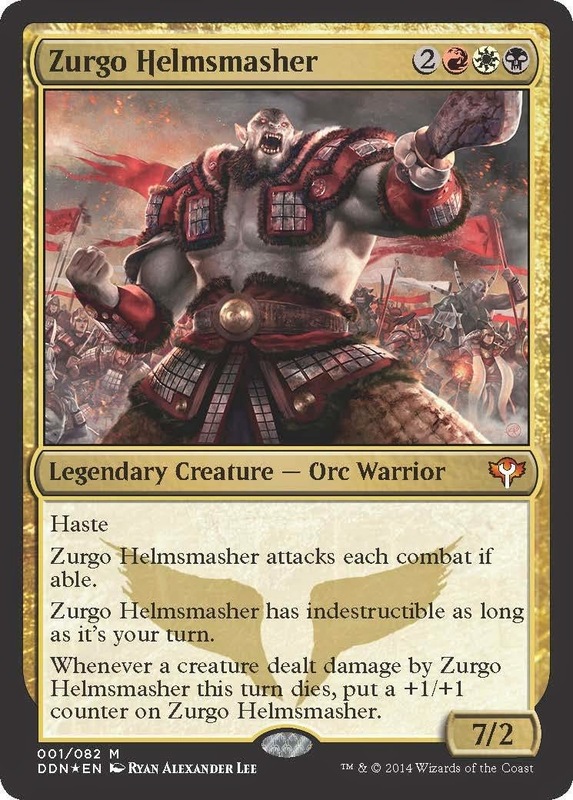 The Mardu's Khan is Zorgo Helmsmasher. Recognize him from the Speed vs Cunning Duel Deck earlier. question time! 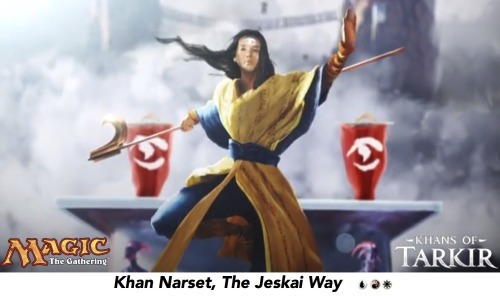 Will we see a three color Planeswalker? Probably! Each clan gets their own mechanic, plus morph is back! One more thing! Curious about mechanics? We're happy to announce the return of MORPH! • a Magic learn-to-play guide. This is great for new players wanting to to learn constructed and getting them into the game - more specifically, Friday Night Magic at their local game store. Wizards of the Coast had done their best to design these to be played against each other and to be a springboard into the game for novice gamers. Alternatively, this also delivers a measure of fun for seasoned players who may use the Intro Packs to battle against a friend, also equipped with an Intro Pack. This arrangement would provide some relatively strength-matched decklists to go up against each other and preclude 'that guy' who seems to have rather deep pockets to fill a list with completely OP cards leading to rapid blow-outs and a failure to deliver fun. Having said that, this decklist can serve as a good chasis upon which to build upgrades. 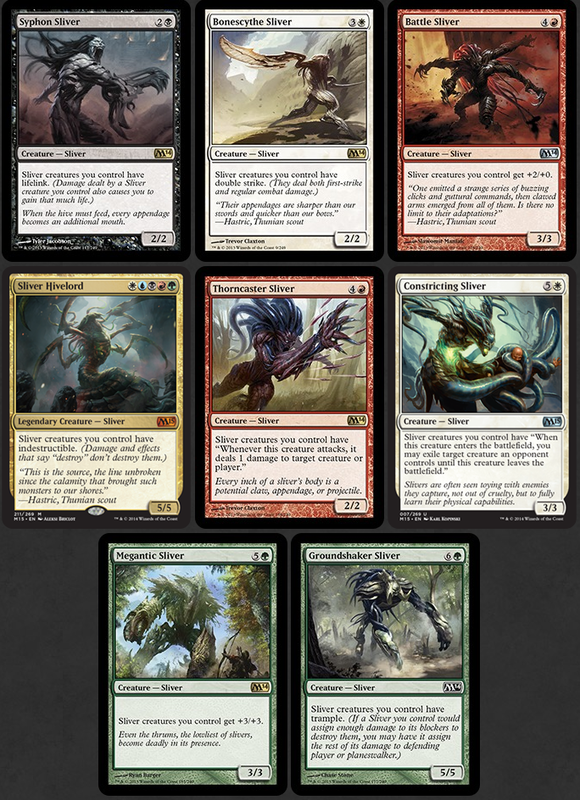 Drop by MTG Mint Card and start your mix 'n' match to increase the power level of this starter. Decklist for the Red / Black 'Infernal Intervention' Intro Pack. 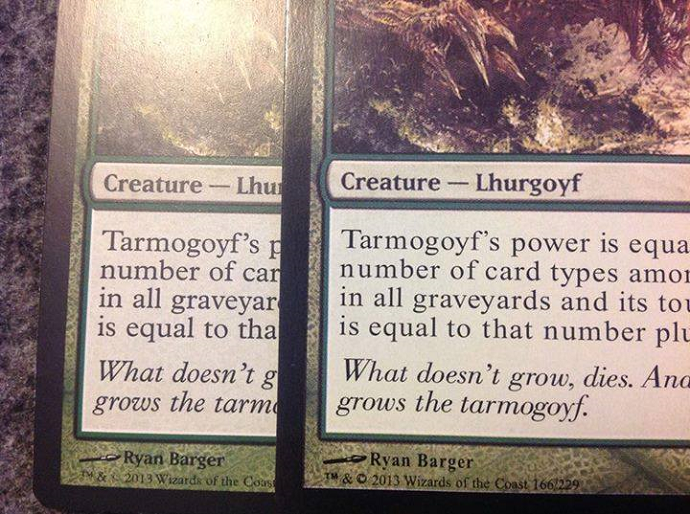 The foil rare Indulgent Tormentor was also the Magic 2015 PreRelease promo. 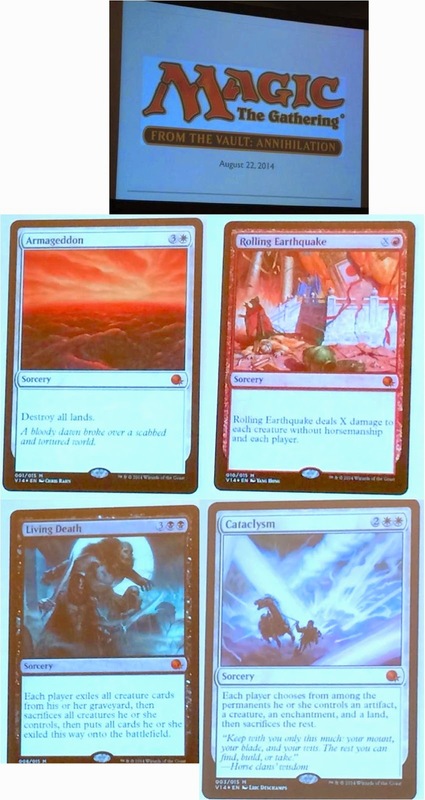 Uncommons : Ancient Silverback, Leeching Sliver, Military Intelligence, First Response, Altac Bloodseeker, Cicle of Flame. 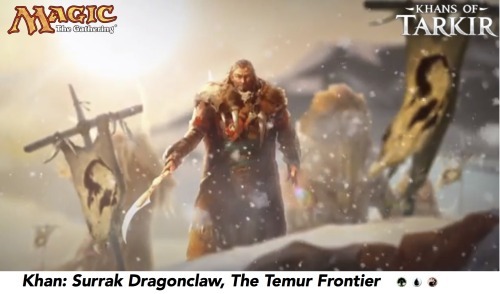 Garruk, Apex Predator, Urborg, Tomb of Yawgmoth, Yisan, the Wanderer Bard, and Stormtide Leviathan. 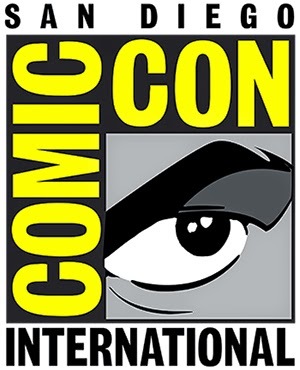 That's it for now, drop by (tomorrow) Saturday as we will have the latest 'knock yer socks off' news from the Magic: the Gathering Panel at San Diego Comic-Con (SDCC) where we may expect previews from a number of soon-to-be-released card sets / products from WotC. 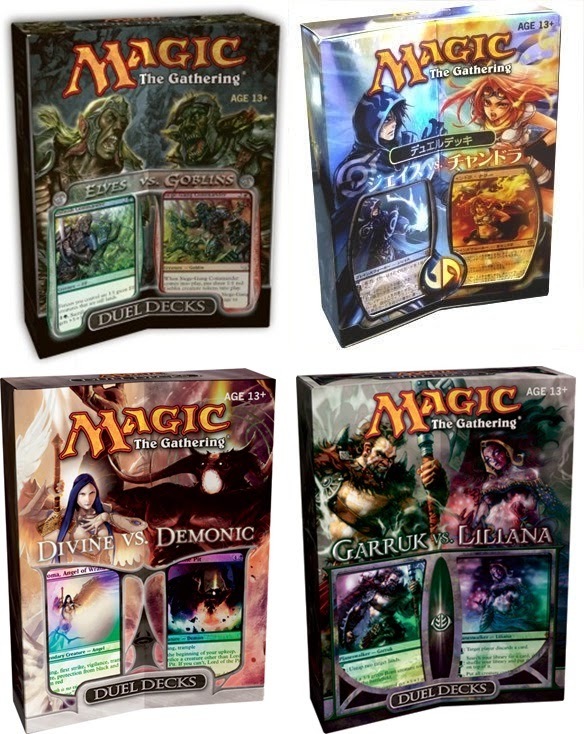 With a large Magic 2015 core set pre-order from MTG Mint Card now in hand, we, like many other Magic: the Gathering players are set to brew up new decklists for standard constructed. One of the very first lists we've created is for standard Slivers and the most important reason for this is improved mana via Sliver Hive which will allow you to tap for one mana of any color when casting a Sliver spell. This, along with Manaweft Sliver essentially provides a solid base to cast every colour or multi-coloured Sliver card out. 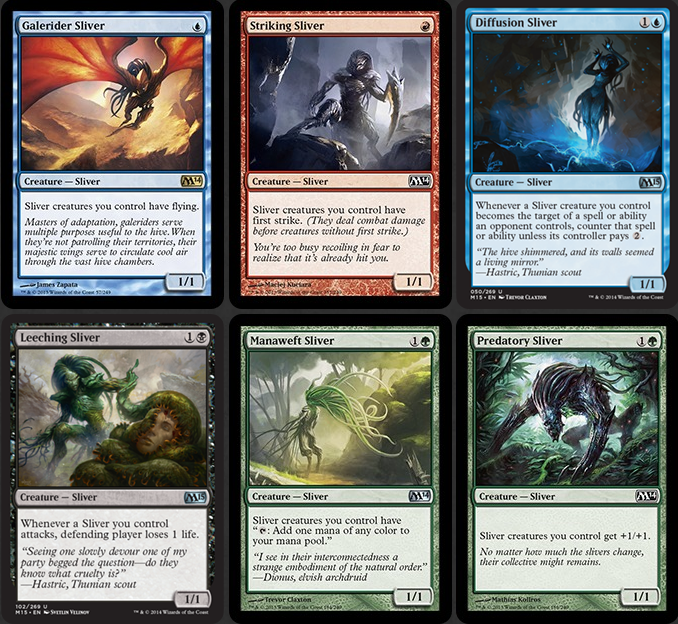 Which is a good thing as M15 has the five colour Sliver Hivelord which will give all your Sliver critters indestructible. But where to go with all our lovely Sliver choices ? 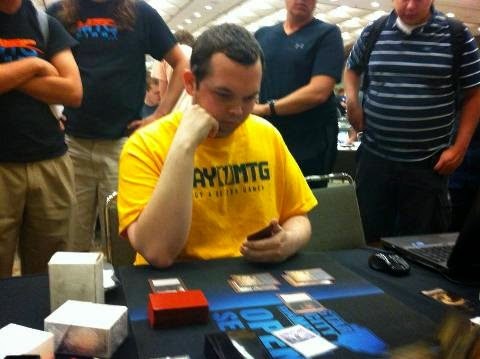 One player - Roy Reese - took along a Sliver decklist to the StarCityGames.com Standard Open in Baltimore last weekend, the first large tournament directly after the release of the new core set. You can check out the Deck Tech over here. Roy placed 88th in Tournament which ain't that bad and one thing he mentioned in the video was the need for Negate to counter non-creature spells, which we will completely agree with for the current metagame. We would also extrapolate this further by suggesting you may be well served in a full deckset of Diffusion Sliver, the blue two-drop fella forcing your opponent to pay two more mana to cast any spell targeting one of your Slivers. There are several rather nice cards that provide assistance to creature-heavy decklists such as Domri Rade, Garruk, Caller of Beasts, and Yisan, the Wanderer Bard which will allow you to extract or float off additional Slivers. We still don't think that a 'tool-box' approach is correct just yet for Slivers. The tough part is deciding the non-Sliver supporting cards such as Simic Charm, Negate, Cyclonic Rift, Ghor-Clan Rampager and others. Not much of a post today for you - but be sure to check back tomorrow as we evaluate a few options on standard decklists featuring M14 / M15 Slivers. 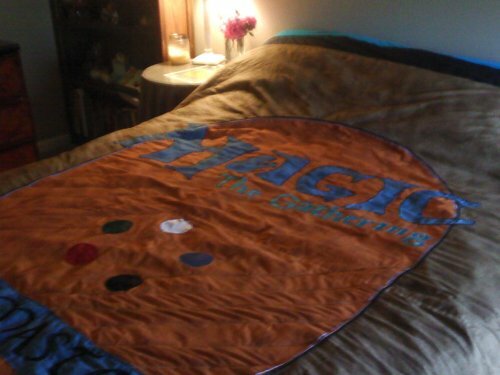 For today, we'll just yatter about a number of miscellaneous Magic: the Gathering related items. 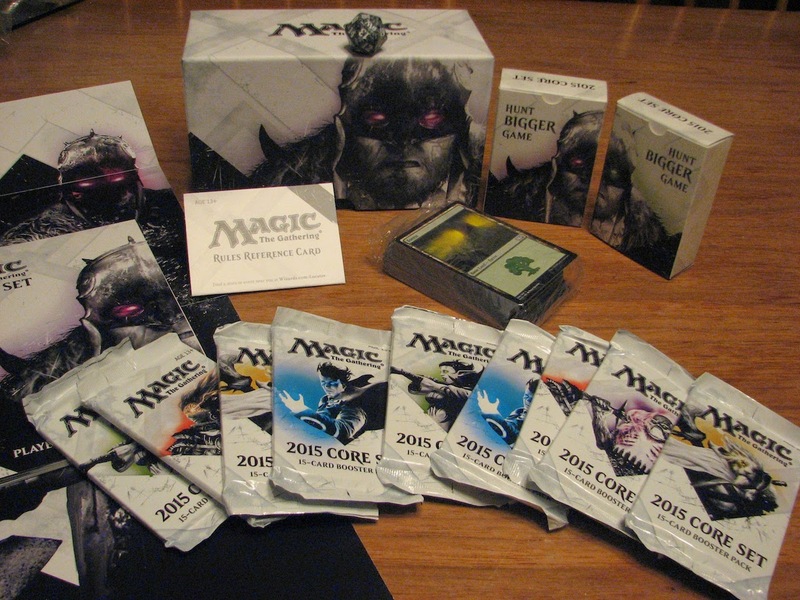 The first large MTG tournament directly after the newest core set, Magic 2015 was released. Not much to say really than this tournament put on by StarCityGames Open Series Baltimore was perhaps too close to the official release for many players to get a hold of the new cards. Dan Jessup won the standard event with a mono-black devotion and the rest of the top decks did not feature much inclusion of new M15. Over on the mothership today, Elaine Chase, Senior Director, Global Brand Strategy & Marketing for Magic: The Gathering had an important update as to what actions Wizards of the Coast had been taking with regards to the increase of counterfeit MTG cards - we suggest you give this a read. 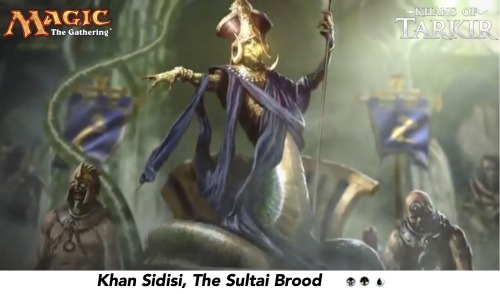 We suggest giving this article from Chas Andrrs on SCG a review to bring yourself up to speed. 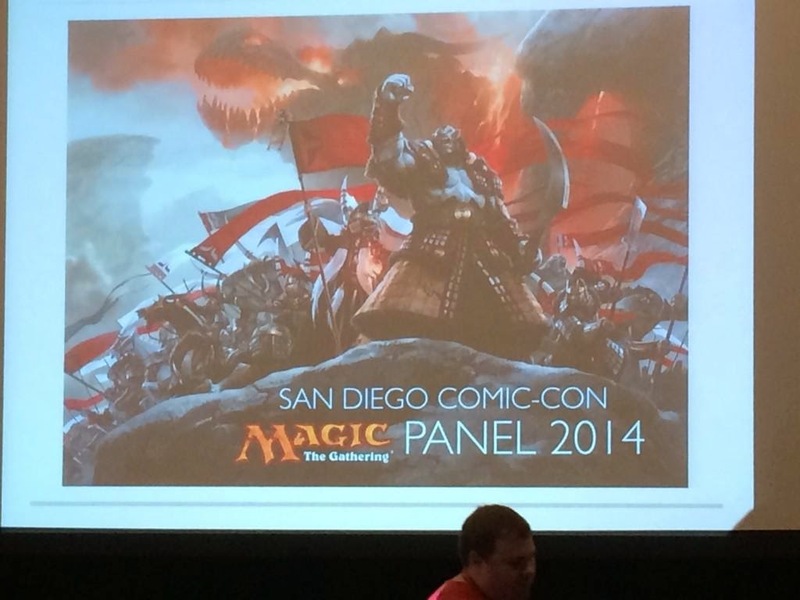 We had already talked last week about on our Tumblr Blog about the return of Wizards of the Coast to San Diego Comic-Con but were not clear as to the WotC panelist. Pop on over to the mothersite here for the 4.1.1. We can expect Mark Rosewater (Magic head designer) to moderate a panel featuring Mark Purvis (Magic director of global brand marketing), Doug Beyer (Magic senior creative designer), and Gavin Verhey (Magic designer). 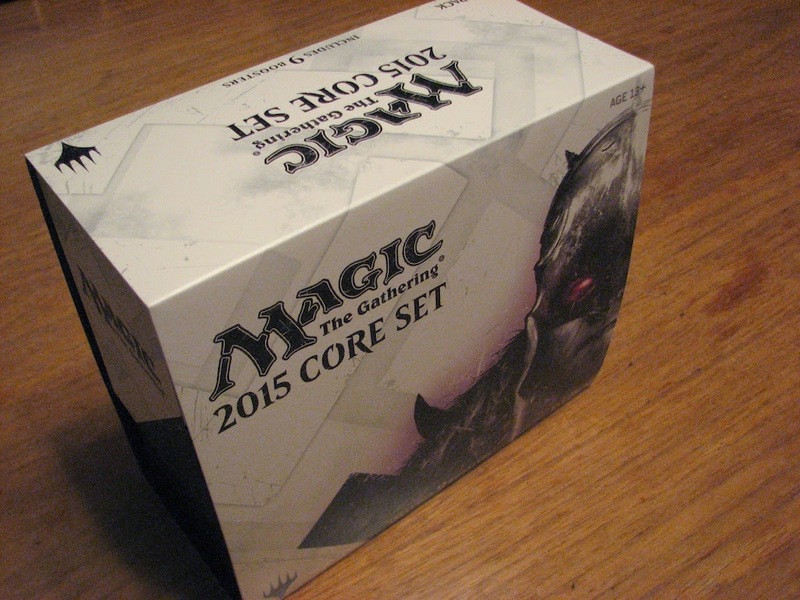 We now have our Magic 2015 pre-orders (a bunch of singles and an assorted card lot) in hand from MTG Mint Card. 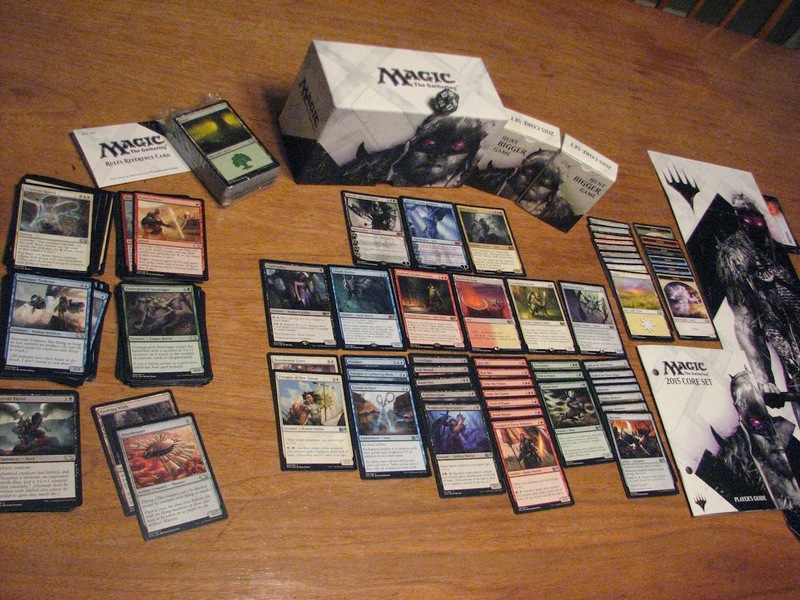 This was shipped super fast by UPS and we can now start brewing some decklists in time for this Friday's Friday Night Magic event at OMG! Games in Barrie, Ontario. Magic: the Gathering players are likely all a rather happy bunch at the moment - the latest core set, Magic 2015 officially released on Friday with the special launch event taking place during Friday Night Magic. 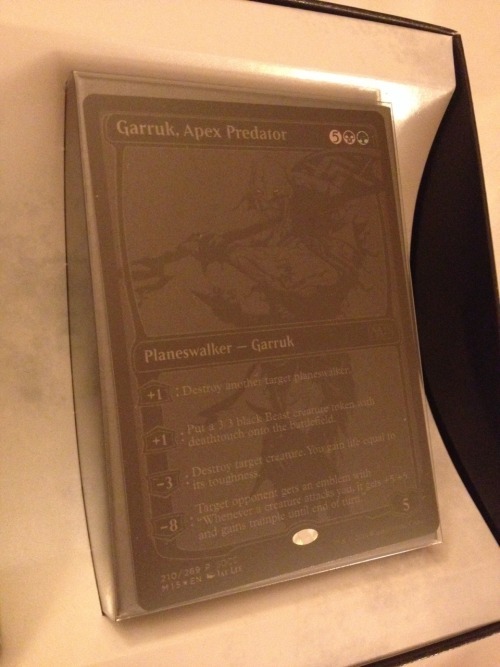 Those in attendance at their local gaming store may have scored a lovely alternate art 'In Garruk's Wake', which although may not see a lot of constructed play, does perfectly present the theme / storyline of this core set. We played on Friday Night at OMG! Games here in Barrie, Ontario, Canada-Land to get our launch promo and try out a new Magic 2015 card in an existing Naya Hexproof Auras decklist we already had. Specifically, we had added a full deckset of Heliod's Pilgrim which, all things considered, is a rather powerful card - being able to search your library for any aura card to get it in your hand is great. We modified the conventional list to run it a bit akin to a 'toolbox' where we floated out the right auras at the right time. Unfortunately we did not do too well at OMG! Games and think we need to modify our mana a titch. Speaking of our local gaming store, they ran a Charity Event on Sunday for a former regular who had been battling cancer. Although the event is over, you can still contribute to good guy William Howe's recovery here. Righto - back on track! We were more than happy with our Fat Pack Pulls - a total of 3 Mythic Rares, one of which is most definitely a 'money card' at the moment. 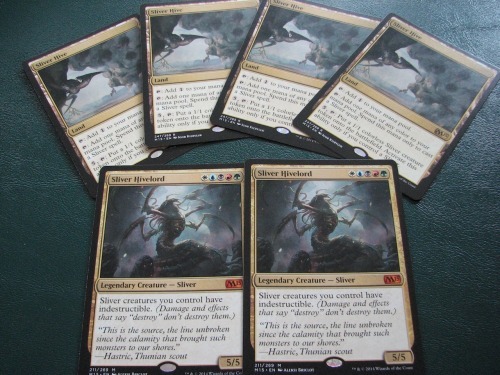 The Sliver Hivelord is also very welcome as we had pre-ordered from MTG Mint a bunch of M14 / M15 Slivers and Sliver Hive as we want to play a fun Sliver build at FNM before this fall's rotation.